Sunny Beach Airport transfer. Cheap taxi hire from Sunny Beach airport to your hotel or holiday villa. Door to door private transfers from Sunny Beach at the price of shuttle service. 24/7 meet and great service, passenger insurance, professional driver's, no charge for flight delays, low Sunny Beach transfer rates. Get your discount coupon for taxi hire in Sunny Beach. Varna Airport Transfer operates mainly in the northern part of the Black Sea coast and implements prebooked transfers from/to Sunny Beach and other Black sea holiday and golf resorts in the area - Golden sands, Albena, Balchik, St Constantine and Elena, Sunny Day. Sunny Beach transfer rates are all-inclusive of air conditioned car, van, bus, professional driver, passenger insurance, free child seats, and fuel. Varna Airport Transfer also provides transfers from Sunny Beach to Plovdiv, Sofia, Ruse, Bucharest, Thessaloniki, Istanbul, Constanta, Sunny beach, Nesebar, Sozopol, Lozenec, Pomorie, Burgas airport, etc. We strongly advise you to book your Sunny Beach transfer well in advance to get the best available rates! Sunny Beach transfer rates are TOTAL per vehicle, NOT per person ! Our courteous driver will meet you in Sunny Beach or at the pick-up point with a name board. 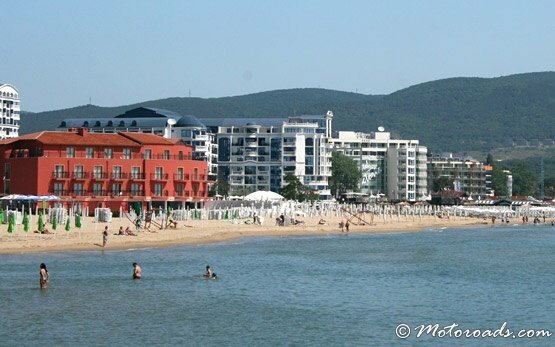 We monitor flight/bus/train delays in Sunny Beach to insure prompt meet and great service. Our Sunny Beach transfer rates are inclusive of driver hire, rental vehicle and fuel. We operate 24 hours a day and 7 days a week in Sunny Beach with no exception.